Gardening > What could be more Christmassy than holly and ivy? What could be more Christmassy than holly and ivy? Holly has come to represent Christmas for many of us, appearing on cards, brightening up front doors and mantelpieces and even decorating Christmas puddings. It’s at its best in winter, with its glossy green leaves and bright red berries and, as a consequence, it was believed to be a symbol of eternal life and many superstitions were attached to it. Early pagans thought a holly tree growing on your land would ward off witches and cutting one down was regarded as unlucky. A sprig of holly attached to the bedpost was said to guarantee sweet dreams! Early Christians may have discounted these pagan beliefs, but they adopted holly for themselves by claiming that its spiny leaves and scarlet berries represented Christ’s crown of thorns and drops of blood. Some people regarded holly as a male plant while ivy was female, so using the two together was believed to represent the union between man and woman. 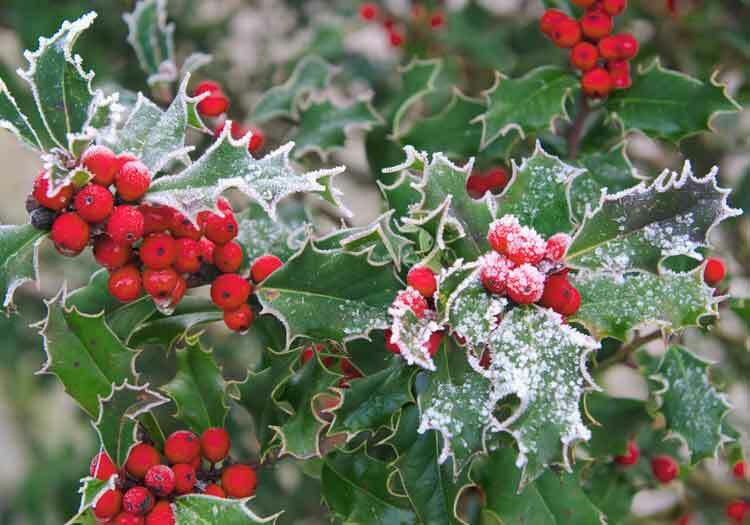 Others believed holly represented both genders as it bears both spiny and smooth leaves. Whichever gender brought the holly boughs into the house to decorate it was believed to be in charge for the coming year! Even today, some say a good crop of berries is a warning of a hard winter ahead, while others believe it’s unlucky to bring holly into the house before Christmas Eve or to discard it before Twelfth Night. Whatever you believe, when all around it is drab and brown in December, holly is a great garden plant. Its shiny, spiny leaves are adorned with clusters of jewel-like berries in bright red, like nature’s own Christmas decorations. There’s rarely a more cheerful sight in the winter garden, and it never looks more festive than when dusted with frost or snow. If you want to grow holly to use at Christmas, choose ‘J.C. van Tol’. It’s self-fertile so its flowers pollinate themselves and it doesn’t need another holly nearby, guaranteeing a bountiful crop of berries. A hardy evergreen shrub with green foliage, red berries and arching stems that cascade over the ground, or can be grown against a wall. A similar herringbone habit, but very decorative foliage of grey-green edged with white, and deep red stems.